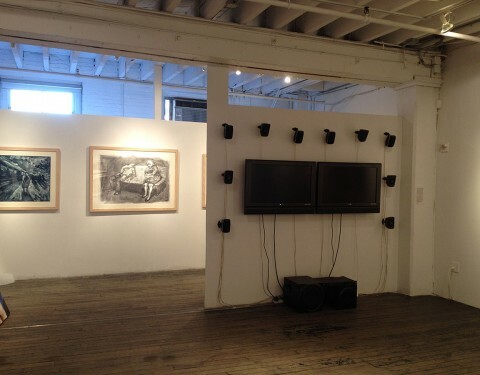 The because i love you installation explores sound. It also explores generative programming, a computer program written to produce a uniquely different outcome each time it executes. The installation consists of two large flat panel screens installed side by side. 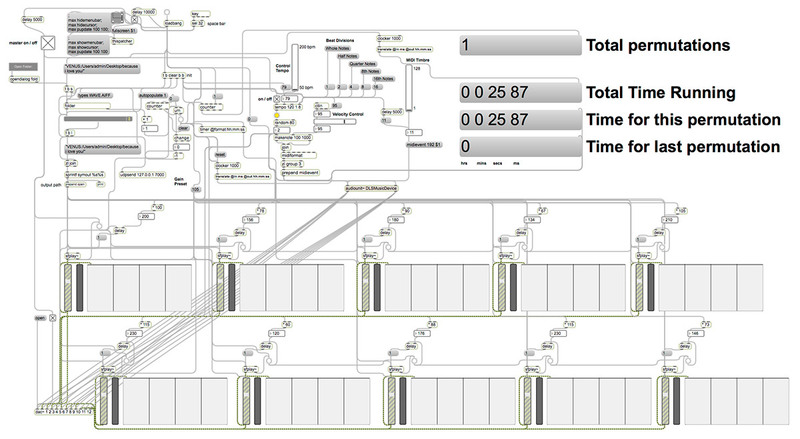 These screens reveal the MaxMSP patches (or programs) that control the installation. They function somewhat like a clockworks, opening the back door of a standing clock and watching all the gears and mechanics click and spin and move. The MaxMSP patches on the screens control a custom built 12 channel surround sound system. 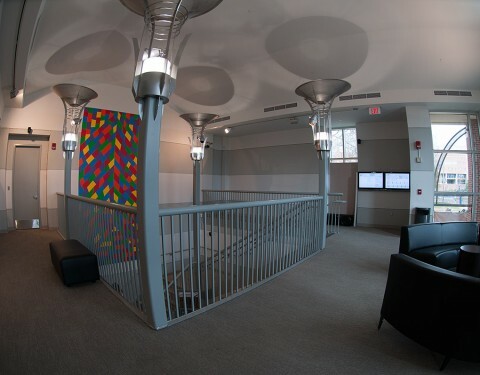 The speakers for the system were installed at various points spanning two architectural levels in the museum space. 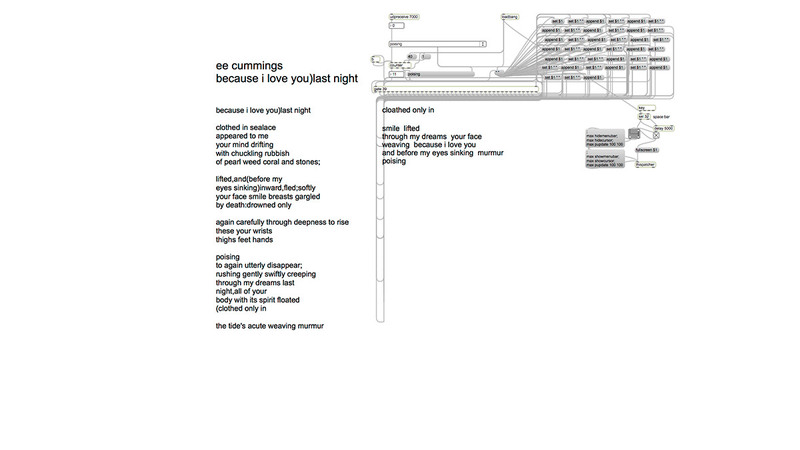 because i love you uses MaxMSP to randomly generate music and continually reconstruct the ee cummings poem “because i love you)last night”. The software randomly generates midi marimba notes. These note values in turn generate delayed trigger times in milliseconds for spoken word samples of the poem. The poem was recorded in bits and pieces, from single words, two or three word chunks, as well as longer phrases. Although the poem samples are selected randomly, each sample of the poem must be used before repeating any previously played part of the poem. The outcome is that the entire poem is continually reconstructed in new random permutations. This is the patch, or program, that generates the music notes and the timings that trigger the audio samples of the spoken poem. This patch has the original poem by ee cummings in the middle of the screen. 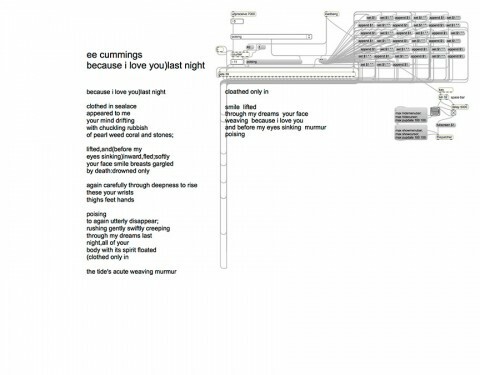 As the patch on the right screen triggers the audio samples of the poem, This patch prints the current audio sample text next to the original poem. The viewer hears the words and can also read the new version of the poem as it is created. After all the samples are cycled, the poem is cleared and the process starts again. Below is the original poem written by ee cummings. My work has always had a strong element of sound. The ether bardo installation and harmonic chant retreat made me realize how central it was to my work. I had created a sound installation called resonance earlier in the year that incorporated Tibetan singing bowls triggered electronically via proximity detection with solenoids. The project explored the concept of resonance via both physics and psychology. In physics, resonance is the reinforcement or prolongation of sound by reflection from a surface or by the synchronous vibration of a neighboring object. 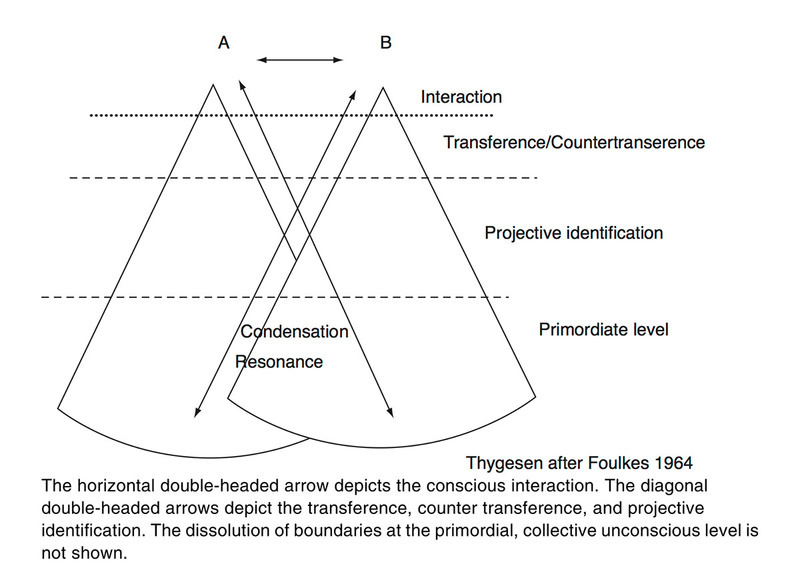 Resonance is also described as a psychological phenomenon by S. H. Foulkes as “communication without any message being sent or received, an a-causal and transpersonal process at the primordial level in the psychic network of communication, the matrix.” As people talk and communicate, that level of interaction creates a much deeper combination of interactions on a subconscious level. Within all of my work this idea of collective resonance is embedded. I can see though you employs multiple voices in different languages as a cohesive group addressing the viewer. The ether bardo is a collection of different “individuals” collaboratively dissolving into a collective “bardo”. The installation because i love you works by layering sounds to form a kind of aural resonance but also by creating a hypnotic repetition. 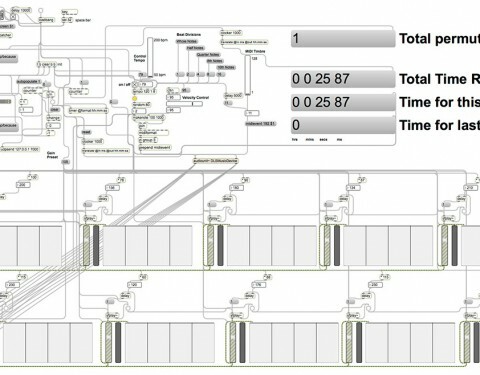 Though spoken via one unique voice, it comes from ten channels positioned across two architectural levels in time-delayed waves.